President Trump’s First Year — We survived! Despite those who had little confidence in President Trump, we are approaching the end of President Trump’s first year in office; and we as Americans survived! Although many have marched in protest, yelled out to the sky, and even threatened his life, President Trump still stands in office and serves this country each day. Those who resist Trump have been painfully obvious and obnoxious as they have dealt with their unwanted reality this year. But in the recent months, I have been in social settings where I have heard not only those people voicing their frustration, but evangelical Trump voters speaking negatively. I’ve heard evangelicals criticize President Trump and verbalize how they are annoyed with him. Of course, I do not expect anyone to always agree with the president of the United States, especially a polarizing president who is not well polished, soft spoken, and says exactly what is on his mind. But is there anyone you would agree with one-hundred percent of the time? Of course not. First, I can understand why people do not like him and why they didn’t vote for him. I respect the difference of opinions. Second, I can also understand why his rhetoric and twitter storms frustrate those who voted for him. Leaving many of us supporters having to defend and go to battle for him each day. The battles can get tiring. But I am alarmed by Christians who voted for him and are now criticizing him. Don’t you remember the crossroads we stood on the eve of November 8, 2016? It was a race for America’s future. Two candidates. Two visions. Two different kind of Americas. One was a vision of progressive secularists who hate God, hate His followers and hate anything of Biblical Christianity. The other was a vision friendly to religious liberty and the sanctity of human life. Instead of complaining, evangelicals should be thanking God for President Trump. Even those who did not vote for him. Yes, I said it. You should be thanking God for him. Because no president in recent history has done as much for the evangelicals as President Trump has. In 2016 I took a public stand urging undecided Christian voters to vote on the issue of the Supreme Court. The president elected would determine the path of this country for the next 40 years. During the next eight years, there will likely be five vacancies in the Supreme Court. Depending on the president’s ideology, that could weigh the bias to a 7-2 vote. If Hillary Clinton would have won, we probably would have never seen another conservative decision made by that court in our lifetime. Our religious freedom would have continued to stand as an open target to be diminished. Well, he came through on that campaign promise with the Supreme Court Justice Neil Gorsuch. So, if you are like many Christians who struggled to cast a vote in the last presidential election, but voted solely on the reason of the Supreme Court, then your president succeeded and kept his promise in which you chose to vote for. So, thank God for him! Trump and his administration have also done much to protect the sanctity of human life. He blocked some $9 billion of foreign aid from being used on abortions by reestablishing the Mexico City Policy. He worked with Congress to allow states to defund abortion providers, overturning an Obama regulation. This week he spoke at the 45th annual March for Life, stating “every child is a precious gift form God.” He is the first president in our country’s history to speak at the pro-life march. Trump also published guidance to keep the Affordable Care Act (Obamacare) from financially supporting abortion, and he signed an executive order to repeal the Johnson Amendment. 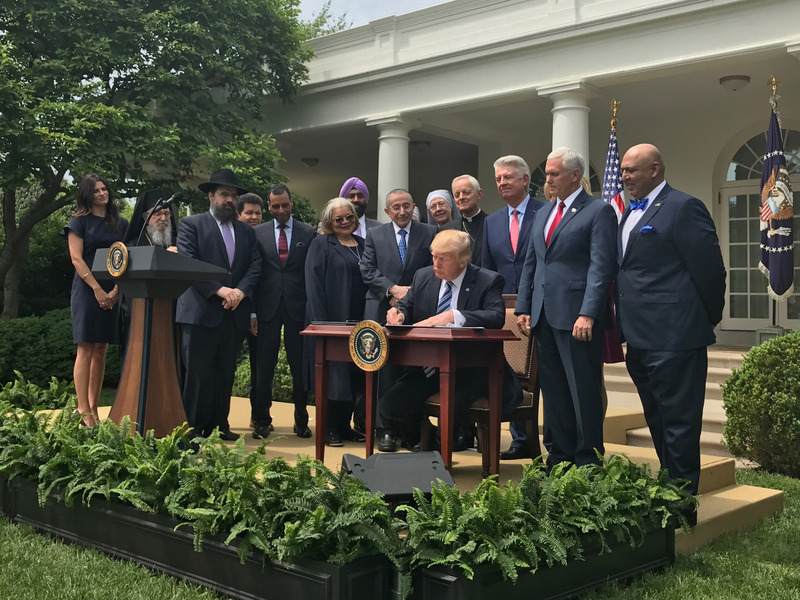 Each of these actions have shown us that our president is keeping his promise to protect the voices of American Christians. In addition to his defense against abortion, President Trump has stood by Israel. As an evangelical, you should be proud of how he has strengthened America’s relationship with Israel after being strained for the last eight years. For the Bible says in God’s promise to Abram regarding Israel, “I will bless those who bless you, And I will curse him who curses you; And in you all the families of the earth shall be blessed” (Genesis 12:3). Like him or not, there has been no president in recent history who has taken a stand for the Christian church like President Trump has. So today, choose to recognize what he has done for Christians in this country and thank God.